Mazel Tov! You made it to the end of Chanukah! Kole and I almost burned down the house on Night 7, when the shamash broke off when I put it back in the menorah. Fortunately there was a spot for Night 8 free, so I didn’t have to risk a huge fire hazard. Close one. This is the final call for 2017, the #8BeersOfChanukah are over. 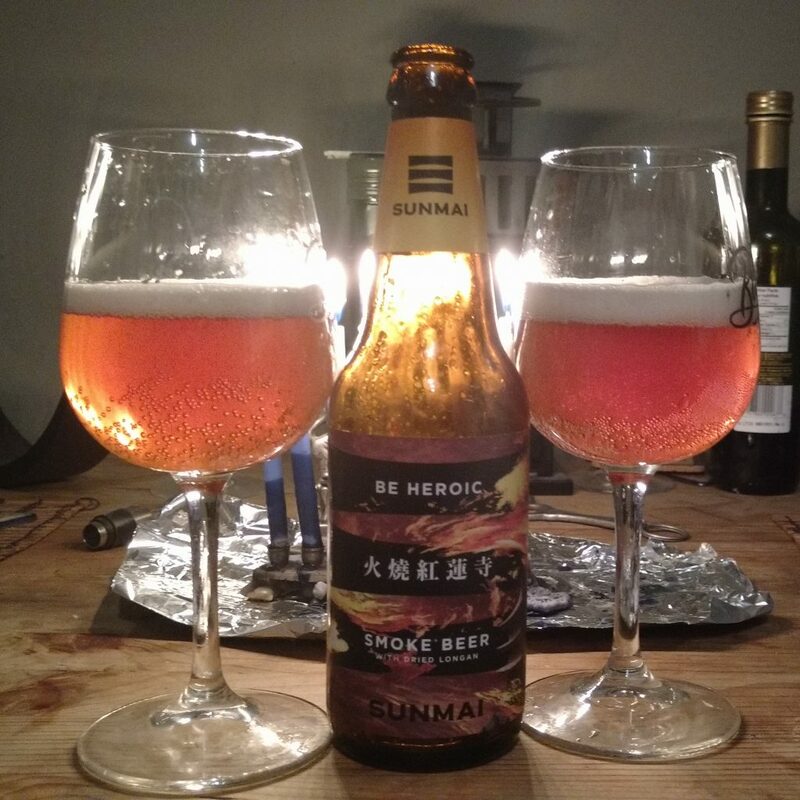 For tonight’s final beer of Chanukah, we cracked open a bottle of 6% ABV Smoke Beer made with dried longan by Sunmai, a craft brewery out of New Taipei City, Taiwan. This is an obscure one, friends. We picked it up at the Taiwan Taoyuan International Airport back in September on our way home from our honeymoon in Thailand and Cambodia. Pro tip: the duty free scotch at Taipei’s airport is the cheapest scotch I have ever seen. Ever. After loading up on our duty free limit during our layover, we stopped to enjoy an overpriced airport beer before boarding our flight. The terminal had a little pop up bar dedicated to Taiwan craft brewery, Sunmai. It seems you can get your beer to go and unopened here, so after downing a few pints I brought one home as a souvenir. Tonight seemed as good a night as any to open it up. I debated hanging onto this beer until Christmas Day, to pair it with the quintessential combo of Chinese food and a movie. I’ve inaugurated Kole into the joys of Chinese food and a movie on Christmas, and it’s kind of his favourite thing now. We were really stressed when we were in Taipei on our way home – I’m not a very good flyer, and Kole’s Kindle was stolen out of his luggage the day before. Neither one of us was in a good mood, and this beer lifted our spirits. The random British guy next to us was pretty happy we were around too – he had packed his power convertor but I had one handy. An all around good time. Appearance: Filtered amber colour with artificial carbonation, medium length white head. Aroma: Hickory smoke, honey, slow roasted pork. Taste: Heavy umami flavour. Seaweed, honey, hearty tomatoes. Honeysuckle flowers, longan fruit, lichees. Smokey without being overpowering. Aftertaste: A balanced flavour that does not linger very long, some residual smokiness. Food pairing: Pair with other umami-heavy foods – miso soup, soup dumplings, Chinese wood fungus salad. Kole says it would go nice with pork belly. I don’t eat pork so I’ll take his word for it. Overall: Quite well balanced. A cliché to feature a Chinese beer, and I can live with that. I am so ready for my Chinese food binge on December 25.